The older I get, the more I love country music. I was raised on it, in a very real way, by my father. He remembers listening to Hank Williams live on the radio when he was young. Live--on--the--radio. I cannot imagine a world in which the great Hank Williams is still alive, but I'd give anything for the chance to listen through my dads' ears, back in those 1940s nights where the kids would gather in front of the radio to listen to the Grand ole Opry. 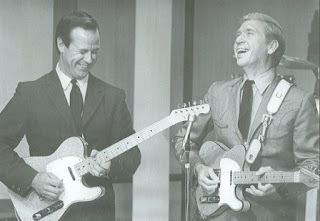 My personal favorite country artist is the late, great Buck Owens. I love this man dearly. I grew up watching him on that corny old 70s TV show Hee Haw, but it wasn't until the past few years I developed a real love for his music. Buck hails from Bakersfield, California, a town which in the 60s became known as Nashville West, because of the overwhelming success of the country artists that emerged curiously from that smallish California town. A self made man in the best sense of the word, Buck grew up playing Bakersfield honky tonks like the Blackboard, a rough scene that involved gallons of beer and hundreds of drunk blue collar toughs trying to impress their women with two fisted antics. 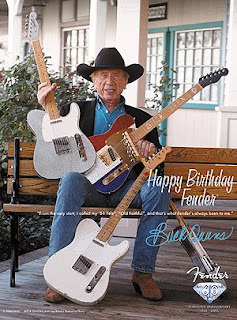 The sound that Buck developed then was a hard country sound, which made use of the Fender telecaster twang of honky tonk and the solid back beat of rocknroll. By the early 60s Buck had honed this sound to deadly sharp perfection. For a short time Buck employed the services of an unknown country singer named Merle Haggard to stand in on bass guitar. It was during this time that Merle named Buck's band...The Buckaroos. The key to the Buckaroos sound was the matter of fact, unadorned vocal style of Buck, along with the eerily tight harmonies and death defying chicken pickin' of Don Rich (one of the finest guitar players of all time). There were over 20 number one country hits in Bucks' glory days, including the effervescent rockabilly of "Tiger By The Tail", "Loves' Gonna Live Here", and "Act Naturally". Even the Beatles were not immune to the energy and drive of the Buckaroos. The Fab Four covered Bucks' "Act Naturally", although their version was a bit tepid. There are thousands of miles between Liverpool and Bakersfield, apparently. 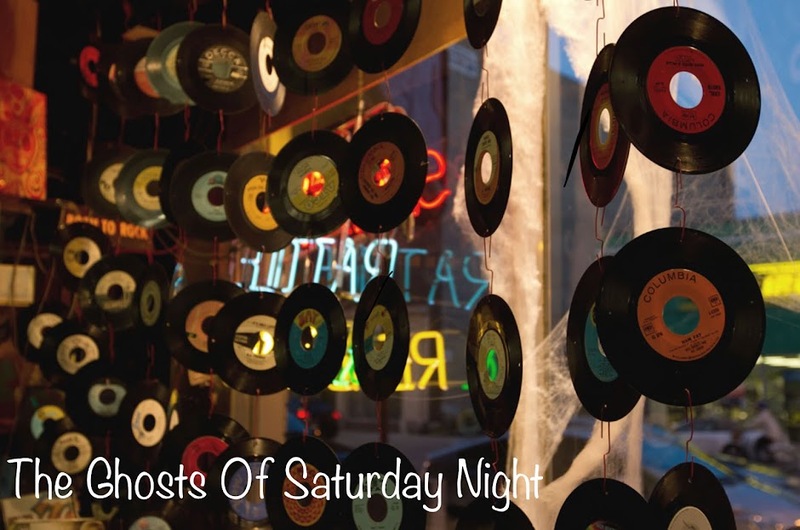 Bucks' lyrics told the true blue collar tale; love lost, love found, drinks drank, hardships endured, fun had. Buck himself was never a drinker and, unlike alot of hard country singers of his day, never did any jail time. Bucks' original era of genius was brought to end by the untimely death of Don Rich in a motorcycle wreck. After this, Buck lethargically stumbled through his career for quite some time, filming the corny country comedy of the "Hee Haw" TV series and resting on laurels. Buck admits this was a time of intense depression for him, as he saw Don Rich as not only his best friend but the very key to his success. The entire decade of the 1970s were spent in this haze of depresion. It wasn't until insurgent country star Dwight Yoakum brought Buck out of semi-retirement in the 80s that Buck started to feel alive again. 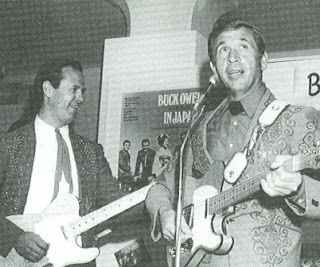 The two duetted on Bucks' old hit "Streets Of Bakersfield", another number one charter. This brought about a resurgence of Buckmania in the country music, which by then had decomposed horribly into the gentrified watered down pop music form that it remains in to this day. Buck died in 2006 in Bakersfield after playing a show at his night club The Crystal Palace. According to those present he put on a storming show, playing all the hits and taking requests. He died in his sleep later that evening. The music of Buck and the Buckaroos provides me with the spring in my step I need to walk through this goddamn world. I'm always in love with a song, and Buck has written and sang many of the songs I love most.